Deciduous tree, very narrow, upright, symmetrical, 40 × 15 ft (12 × 4.5 m); possibly wider in the eastern US. Leaves opposite, simple, medium green, fall color yellow-orange to reddish-orange. Female tree, flowers pale orange, it does produces fruit (seeds). 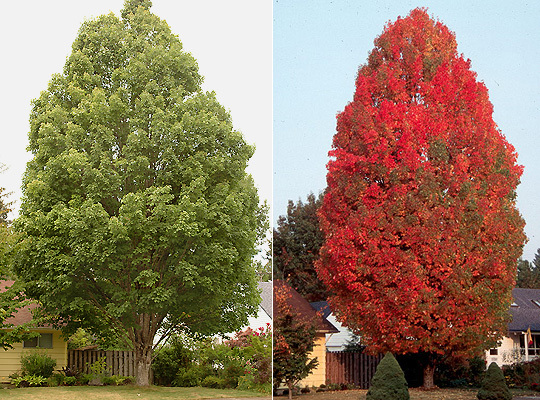 Selected by the Scanlon nursery of Ohio in 1946 and named in 1951, the original tree was near Cleveland and named after the road on which it was discovered (Jacobson, 1996). However, Dirr (1998, p. 47) reports that it is sometimes listed as a 1948 introduction of the Cole Nursery Co., Circleville, Ohio.